Ground motion models (GMMs) are a key component in seismic hazard assessment and in seismic risk analysis. The consideration of both aleatory and epistemic sources of variability may have significant influence on the results and are vital because of their influence on the over- or under-estimation of the final assessment of losses. Recent research has shown that the commonly used framework of weighted logic trees for the choice of GMMs is not necessarily the best suited to account for epistemic uncertainty. Recently, a simple and alternative procedure has been proposed in which a GMM suite is defined with only three representative models (lower, central and upper) derived from available median models. This alternative model is equivalent to the use of multiple models, provided the same range of epistemic uncertainty is sampled. 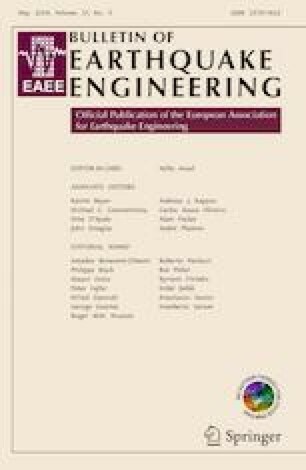 The representative suite approach was applied to the European context for developing a Pan-European GMM for EC8 ground type B and normal or strike slip faulting style for its implementation in risk analysis of critical infrastructures Europe wide, within the framework of the European funded project INFRARISK. The proposed new Pan-European representative GMM is based on the most recent GMMs developed using the common RESORCE strong-motion database of European and Near and Middle East acceleration records. It is shown to perform well when tested against new ground-motion observations from the ESM-Engineering Strong-Motion database and even slightly better than other available GMMs. The procedure is efficient and transparent limiting the sample space to three GMMs and reducing both complexity of the modelling and computational efforts. The online version of this article ( https://doi.org/10.1007/s10518-019-00605-4) contains supplementary material, which is available to authorized users. This study has been carried out in the framework of the European project INFRARISK (Novel indicators for identifying critical INFRAstructure at RISK from Natural Hazards. INFRARISK is funded by the European Commission’s FP7 programme, Grant Agreement No. 603960. Further information can be found at www.infrarisk-fp7.eu. The authors are grateful to the Associate Editor John Douglas, Graeme Weatherill, and one anonymous reviewer for their thoughtful comments and constructive suggestions that helped improving the manuscript and clarify some important points.